The commissioner of the Ontario Hockey League says his organization failed the players under its care. David Branch says he didn't know how bad the hazing was for players like Daniel Carcillo. Carcillo and other players went public this week with allegations of brutal hazing. In an interview with CBC Sports, Branch called the allegations "sickening." "We had failed Dan and the other players involved in my view, and it's shocking. You know, I don't know how else to put it," Branch says. Over the last few days, four members of the 2002-03 Sarnia Sting have come forward to tell their stories of what they went through. "I moved away from home at 17 to chase my dream of making it to the NHL and making something of myself. And what myself and 11 of us had to endure that year was daily abuse," says Carcillo, who went on to win two Stanley Cups with the Chicago Blackhawks. Carcillo detailed being stuffed into a bus bathroom naked and having teammates spit tobacco juice on him. He also told of players being stripped naked, tied down and beaten with a jagged goalie stick. Some of his teammates, including goaltender Ryan Munce, quickly came forward to corroborate Carcillo's allegations and tell their own stories. "There's guys that were acting like KKK [Ku Klux Klan] because I was dating a girl of a different nationality, doing Hitler signs in front of our Jewish teammate until he went to tears," Munce recalls. "This is constant abuse day in, day out, strapping a guy to the table and beating him with belts and things, that was the 'rookie of the day.'" Branch says Carcillo contacted him directly during that season about what was going on in Sarnia. He visited the team to investigate, but was told by management and the coaching staff that no serious incidents had occurred. "There was one situation that they described, which while it was dangerous in my view it wasn't something that called for any particular discipline," Branch recalls. "That situation was rookie players being put in the laundry cart of the team and pushed down the hall and you know kind of recklessly bouncing off the walls and things of that nature. And that was really the extent of what came at me and the discussion as I recall." Jeff Perry, Sarnia's head coach in 2002-03, initially disputed Carcillo's claims that management was aware of the abuse. However, Carcillo tweeted on Thursday that Perry was among members of management who have taken accountability. A call to Perry by CBC Sports on Wednesday seeking further comment was not returned. Branch says a major change for the league around hazing came in 2005. That year, the league issued a major set of fines and suspensions to the Windsor Spitfires over a series of hazing incidents. "That was the first time and, quite frankly, the only time it's come to me about issues around initiation, hazing and the like," Branch says. Nonetheless, he says the league has instituted a series of initiatives including a zero-tolerance hazing policy. "We had to support the players, make sure they understood what's right, what's acceptable, what's not. And more importantly, I would suggest, here's how you can reach out if you're not comfortable with going to your own coach or general manager," Branch says. Branch also points to a number of mental health programs the league has put in place. "People look at our league that it's the No. 1 development league in the world for the National Hockey League, which it is. But our focus the last 10 to 15 years is how do we support the person? And that's where we've made such tremendous progress, which we're so proud of." Others in the hockey community seem to echo Branch's sentiments that hazing is a by-product of an old hockey culture that no longer exists. "I think there needs to be an understanding that things have changed greatly," says Eric Wellwood, the coach of the OHL's Flint Firebirds. 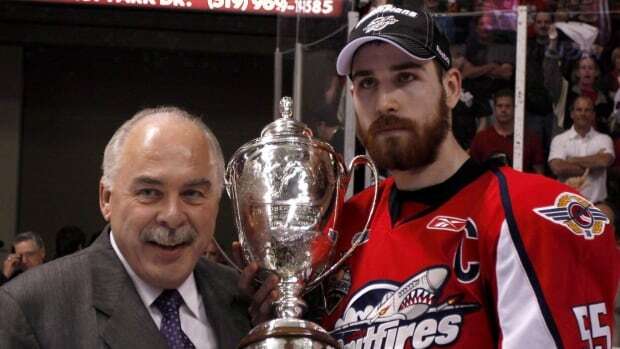 "Through my experience in the OHL, from the time I was a 16-year-old back in 2006 until being now a head coach in the league, they've eliminated all these bad, bad things that surround the league — in particular, hazing. And in the end, I think that the OHL deserve credit and not to be smeared with a story that may be true but that happened a long time ago." On Thursday night, the OHL released a statement reiterating​ its commitment to the anti-hazing policy. "In light of the recent attention that has been paid to the issue of hazing, the league has spoken with team management, and all of our member teams are providing a refresher to all staff and players about this most important topic," read the statement. "Our hope is that through conversation, education and awareness, the attitudes that lead to hazing behaviour and these unthinkable actions disappear from sport and society." A number of current NHL players have also reacted to Carcillo's comments, including Vancouver Canucks forward Bo Horvat. "It's tough to hear that kind of stuff, but I think that kind of faded out in my era of junior hockey," Horvat says. "I've heard a lot about it and heard what guys have gone through in past years, but I think we really cracked down on it when I started coming in junior, so I didn't get any of that kind of stuff. Thank God." Carcillo and the others who have come forward hope Branch and Horvat are right. Carcillo also says he appreciates the members of the Sarnia Sting who have reached out to talk about what happened. At the same time, change in hockey doesn't happen overnight. "When you're singularly focused on a goal, it's kind of scary what you'll accept to try and achieve that goal," says Carcillo. "And if you talk and if you talk too much in the hockey world and you ask too many questions, they don't like that. They'd like you to be a good little soldier and to do what they say."